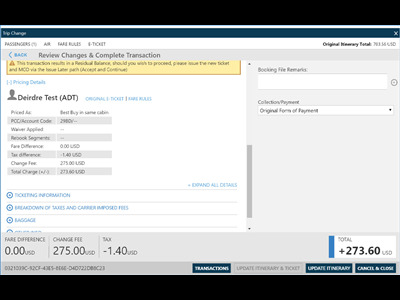 Trip Change automates the complex itinerary re-pricing task in a new user friendly interface, allowing agents to efficiently re-price a ticket in a matter of seconds. 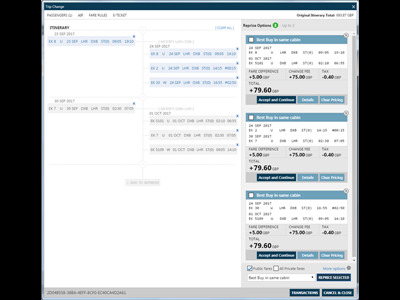 The process of locating original ticket data, interpreting fare rules correctly, building new filed fares and storing the exchange data is automated. 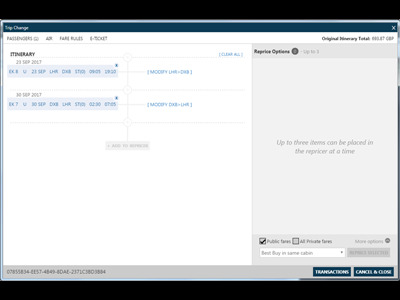 Trip Change is powered by the Travelport Rapid Reprice engine which benefits from more than 12 years design and development expertise. 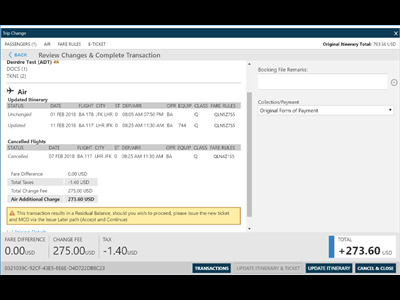 Automatically calculates the new price for any passenger requested change to an electronic ticket on a Rapid Reprice participating carrier. Processing is entirely based on Rapid Reprice participating carriers’ intent as coded by these airlines in ATPCO and SITA Category 31. Produces the required results for successful exchange, including any additional collection, refunds and/or change fee amounts.